Marvel Studios(VIRGINIA) — If you were on Twitter Sunday night during the Oscars — if for no other reason to celebrate Black Panther‘s multiple wins — you may have noticed there were spies among you. Literally. 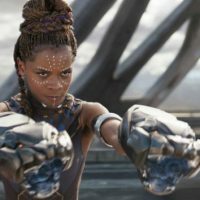 The CIA began tweeting about the film, specifically about one of its fictional — but key — elements: Vibranium, which is central to all of the advanced technology in Panther’s kingdom of Wakanda. Fortunately, only 8% thought it was real stuff. The spy agency also posted a video of one of its scientists talking about how Black Panther‘s high-tech Kimoyo beads — which can do everything from helping Wakandans communicate, to stabilizing gunshot wounds — would come in handy in the real world. For the record, the CIA is portrayed in the film, at times to bumbling effect, thanks to Martin Freeman’s spy character, Everett Ross.